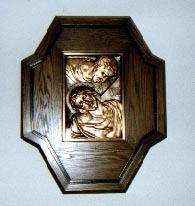 Weberding's Carving Shop is a name well known for Church Furnishings. Although we are a small business we are known across the country to be a top quality manufacturer of custom made Church Furnishings. We have 65 years of experience in the Church Furnishings Business. 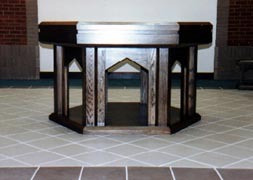 When we are being considered for a project, we visit the Church or area, and design furniture to match the style of the Church or area being constructed. We have our own designers who create by hand the beautiful drawings of furnishings. This enables the customer to see what the product is actually going to look like. The pictures shown here include a variety of altars, a baptismal font, a lectern, decorative frame for stations of the cross and an overall view of St. James Church, White Oak, Cincinnati. OH. 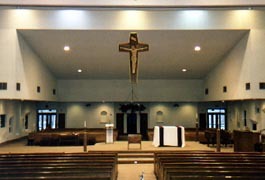 We recently made all the furniture for this Church including the hanging cross and Corpus in the middle of the Church. We have received many compliments for our work there and a number of people from their Parish have visited our shop. We take great pride in this portion of our business and the quality shows through in the products themselves. Visit our Religious Carvings and Statue Refurbishing links for more information related to Church items. We can also incorporate some of the old furniture into new. 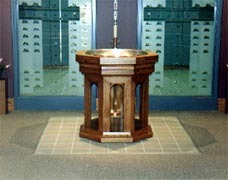 For example, we did a project in Bloomington, IL where we built a new altar and used some of the marble from their old altar. This is why custom furniture is such an advantage. 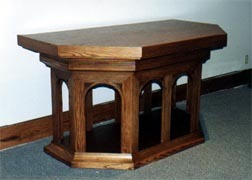 Instead of buying something that is mass-produced, we can make furniture that compliments the style and design of the Church.